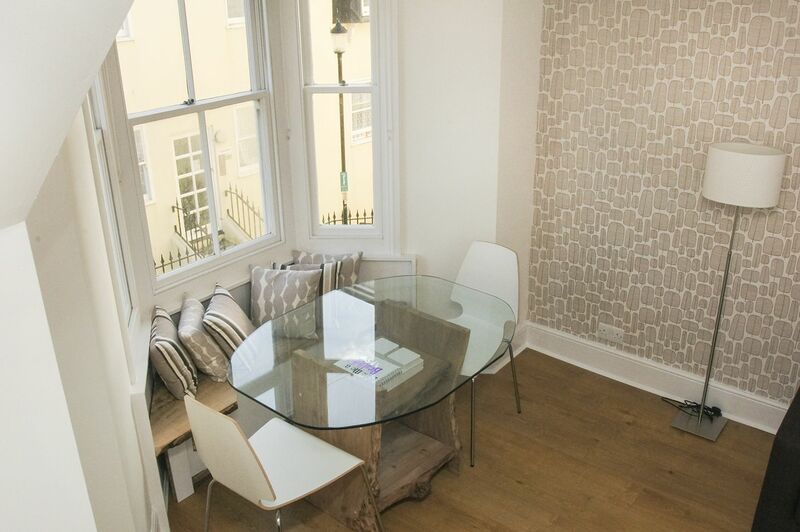 Stylish and thoughtfully designed first floor two bed maisonette to sleep six in the heart of vibrant Kemptown. Oblique sea view, a homely space, an adjacent parking space, and with the beach at the end of your street, this will create a great travel experience . Fully equipped kitchen with plenty of cupboard space. 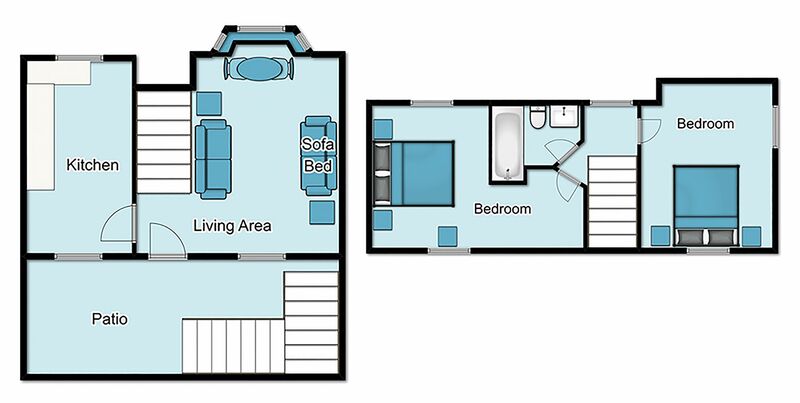 There is everything you would expect in order to be fully self catered including separate under counter fridge and freezer, slim line dishwasher, microwave and electric four ring hob with oven/grill. You will find the washing machine in a utility cupboard along with the other usual suspects. Your dining experience has been lovingly crafted with a handmade window box seat so that you can enjoy the oblique sea views. A feature glass table is set upon a beautifully handmade wooden base. 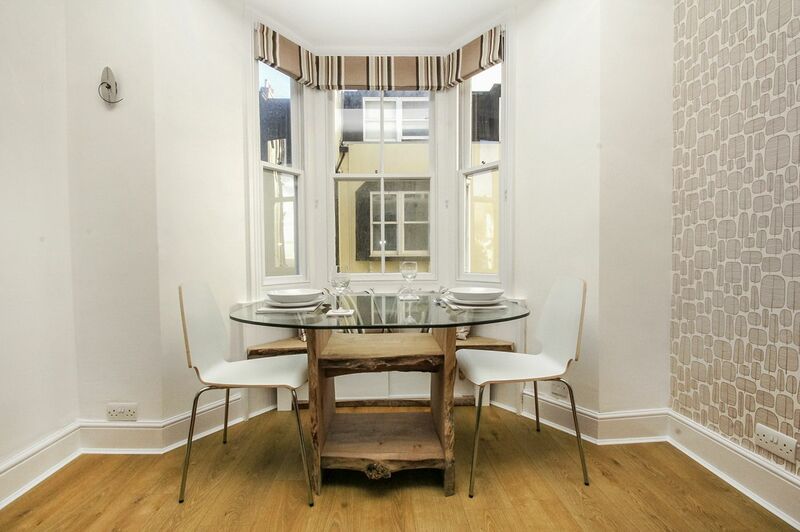 With a total of four dining chairs and the window seat there is plenty of room for you all to come together. Stylish and contemporary lounge well lit from both sides with feature wall and wooden floors. There is a two seater sofa and a three seater sofa that transforms into a sofa bed for extra guests. Two lamps offer some soft lighting and the perspex occasional tables provide somewhere to rest your glass. A rug cosies it up for your feet so you can sit back, relax and perhaps watch a film on the Blu-ray player and 20" flat screen TV. You can also play music on the DVD player or through the usb port. 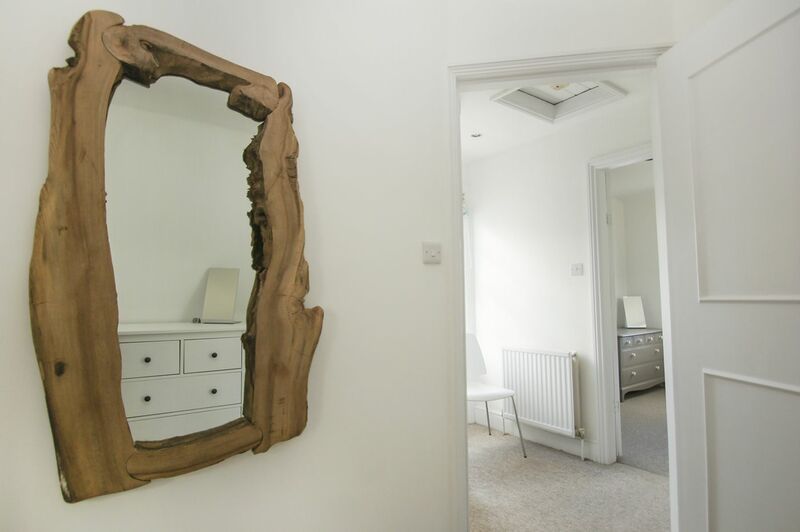 The handcrafted wooden theme continues in the master bedroom with a gorgeous mirror, console table and frame with headboard for the king size bed. This spacious bedroom houses a wardrobe with internal shelves and a very generous set of drawers and bedside tables with touch lamps. This bright bedroom with its attention to detail with the roman blinds, cushions and table design offers a zip & link option for those who would like to sleep separately (please request at the time of booking.) When together the bed is king size and separately they measure as 2'6" singles. The bedroom is complemented by a shabby chic double wardrobe and drawers. A hotel style finish, this bathroom enjoys a great splash of light thanks to the loft window. There is a bath with shower overhead, WC, sink and heated towel rail, along with some wicker storage drawers for your toiletries. A real treat to have your own outside space, even though you have the beach and the pier on your doorstep. The patio is a great area to hang out at any time of day. The cottage has its own private on street entrance with hooks and room for bulky items such as bikes and buggies. The cottage is accessed by two flights of stairs to the patio. This property has a free of charge allocated parking space across the road.